Where Does Specification Responsibility Lie? Designers, project managers, installers and building consent officials exercising duty of care responsibilities would positively contribute to raising the bar on all passive fire protection installations in NZ. Attending the NZIQS Conference and Expo recently, our attention was drawn to the number of discussions we had in relation to passive fire protection to the exterior of the building. Quantity surveyors, project managers, fire engineers, architects, facility managers and developers alike expressed an interest in the products and systems available in NZ. While NZBC compliance of these systems was always in the discussion frame, it was evident that no-one had any idea of where the design and specification responsibility lies. Some thought it should vest with the cladding system designers and others with the architect as part and parcel of the overall building design in collaboration with the fire engineer. This may be all well and good in new builds and the Building Consent Authority (BCA) should ensure this aspect is addressed in the fire engineering report at the PS1 stage of the consent process. What about after the consent has been issued and the building is under construction? Where no provision has been made for passive fire protection to the exterior of the building should it be placed on record that, as a professional exercising duty of care responsibilities, this aspect of fire safety has been drawn to the attention of the developer/owner? The earlier passive fire protection, and specifically fire stopping, is incorporated into the design framework, the more benefit can be derived from cost-effective, compliant and fit for purpose solutions. 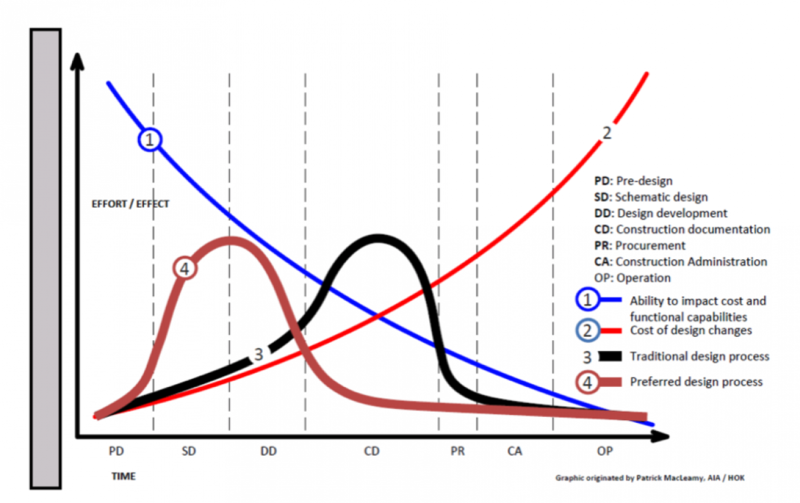 The MacLeamy curve illustrates when the most impact can be brought to bear on cost and functional capabilities — at schematic design and design development stages of a project. In recent times we have seen a marked increase in the number of enquiries about external fire protection from all manner of professionals. Most are at design stage and there appears to be quite some interaction between the cladding system manufacturer’s design teams and architects and fire engineers. This is an encouraging development in the market. We are also taking calls from on-site construction/project managers wanting to understand what can be added to the construction process to cover this aspect of fire protection. Often it is too late in the piece and access to the floor slab edge from either the outside or the inside is not practical. Where it is deemed practical, the dimensions of the void determine the appropriateness of the system to be installed. This in turn impacts on the time the installation will take and if this fits with the overall project plan. In some cases the decision is made not to proceed with this and although this decision has now been placed on record, the BCA may not be aware that this investigation has taken place. This brings into question building officials exercising duty of care responsibilities. We have had occasion where the decision is to continue with the installation and at this point the fire engineer should be engaged to do an assessment of the proposed installation. Compliance aspects of the proposed passive fire protection system would form part and parcel of this assessment. The last thing anyone wants is for the building official to withhold the issuing of the CCC due to non-compliance issues relating to an unconsented installation of fire safety systems. The commercial aspects of the installation should be weighed against the numerous risk factors associated such as being seen to be complicit in the decision not to install potential lifesaving passive fire systems. By not engaging all the stakeholders in the process of investigating the opportunity to install potential lifesaving passive fire systems, you may be considered to be condoning the practice of avoidance of exercising duty of care responsibilities. The installation of lifesaving systems should never be compromised due to commercial considerations. All lifesaving systems should be seen as non-negotiable irrespective of the commercial reality. We should not put a price on a human life. There should be no reason not to include passive fire protection to the exterior of a building. The FRR could be up to 120 minutes and cover voids of up to 450mm wide, closing up to a 50mm ventilation gap. Passive fire protection can have up to a 25 year life expectancy, be non-toxic, low VOC and contribute to Green Building. These systems can be easy to install — at the right stage of the project plan. At the design stage of re-clad projects on leaky buildings. On consented projects where passive fire protection was not included in the consent documents. New building concept stage and again at design. Compliant products and systems are available for both new project specifications and for inclusion in projects post-consent / under construction. Various products and systems have been tested to AS1530.4 and where the product is tested outside the ASNZ jurisdiction an assessment to AS4072.1 would demonstrate equivalency. In addition to these there is the alternative solution process that may be adopted. Any alternative solution should be fully supported by the product manufacturer. Any deviations from the consented documents will require a consent amendment unless otherwise specifically agreed with the BCA. It is obvious that, like with most passive fire protection installations, it should not be left out of the design phase of the project. The more consultation that takes place on the subject of passive fire protection, the better the industry will understand the technicalities and compliance regimes.